Christian discipleship, it is often observed, is not so much a destination as a journey, a lifelong pilgrimage in which we daily travel from the old to the new. But what does that mean in practice, and how does it apply to Lent? On this recording, Nick Fawcett explores such questions through three sets of paired themes: putting off the old self and putting on the new; giving something up and taking something on; and, finally, celebrating what God has done and all he has yet to do. Complemented by carefully chosen music, this CD offers a rewarding yet challenging perspective on Lent in which endings are matched by new beginnings  our past balanced by Gods future. 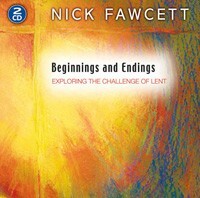 Beginnings and Endings by Nick Fawcett is published by Kevin Mayhew and is our 39652nd best seller. The ISBN for Beginnings and Endings is 1490203. Be the first to review Beginnings and Endings! Got a question? No problem! Just click here to ask us about Beginnings and Endings. Now Playing: Introduction Your browser does not support the audio element.